The Adidas Campus Vulc II is a classic sneaker that stays close to its '80s design, while staying modern for today's street and fashion style. Rocking a black nubuk upper with the iconic 3-Stripes and heel patch, these shoes feature a reinforced toe cap. 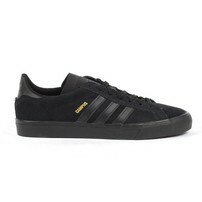 This is the all everything black version of the classic shoe.